Emerald has been prized, important, sacred and very expensive for thousands of years. It is one of the most precious gemstones in the world. The defining characteristic of emerald that makes it so desirable is its color: an inspiring emerald green. 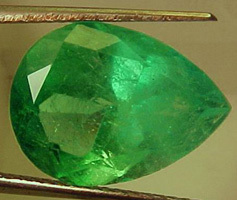 The most valuable emerald is of a striking, perfect "emerald green", large in size (over 5 cts. ), fairly clear and perfectly cut (faceted). Lowest Value: These emeralds are so included, they are opaque. Their color is dark and dull. They are small and poorly cut. Emeralds like this are not worth much. Low Value: The emerald in this ring has better clarity than the ones to the left. The clarity is still rather poor, however. The cut is mediocre and it is small. The best thing about this emerald is its lovely color. If this gemstone were by itself, it should not cost more than $100. High Value: This emerald has poorer clarity than the one before. However, its intense glowing color and its large size make it worth more. Highest Value: Here is an example of one of the highest quality emeralds you can buy. 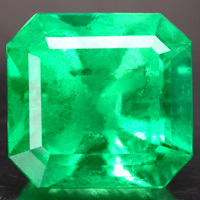 It is large (over 2 carats), very nice clarity (for an emerald), perfect cut, and glowing emerald green color. An emerald like this is worth several thousand dollars. Color: The most important determiner of an emerald's quality is its color. 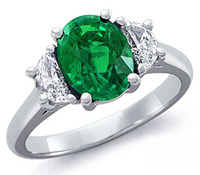 The best color for an emerald is a bright intense green that is not too dark and not too pale. Size: The bigger the emerald, the more valuable it is. Very small emeralds can be purchased quite affordably, because there is less material, and also because small emeralds are less rare than large emeralds. Cut: The price and value of an emerald is also determined by the quality of its cut. A well cut emerald will sparkle and reflect the maximum amount of light. Clarity: Almost all natural emeralds have some amount of cloudiness or internal flaws, called inclusions. It is acceptable for emeralds to have less than perfect clarity and it does not lower the emerald's value. However, there is a significant difference in emeralds that are heavily included, or are so cloudy that they lose their transparency. 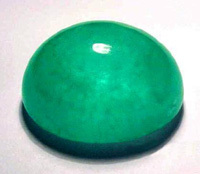 Shape: Oval, Rectangular and square emeralds are quite beneficial for astrological purpose. Treatments, Synthetics and Imitations: Almost all emeralds are natural, except emeralds with no inclusion. Always buy lab certified emeralds for astrological purpose. Astrology Significance: Emeralds have a lot of healing properties and have been important to many cultures for thousands of years. Learn more about Emerald Jyotish Significanceto see if it's something you relate to. 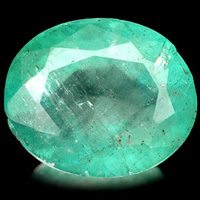 Below are large pictures of individual emerald gemstones and emerald jewelry discussed and analyzed. Here is an emerald cut into a cabochon. 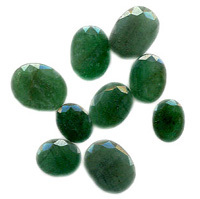 Emeralds cut into cabochon are always of poorer clarity and are generally less expensive. However, this one has a very nice green color which makes it more valuable. These are examples of the worst quality emeralds. The clarity is very poor, the cuts are bad, they are small, and most importantly, the color is dull. Do not buy emeralds like this unless you just want to own an emerald and you're on a tight budget. The emerald in this ring is nice and clear-a little too clear. In fact its absence of the characteristic inclusions is an indication that it is synthetic. The cut is okay: allows for a nice reflection of light. The green is just a tad too yellow. This emerald is nice and clear and very well cut (emerald cut). However, the green color is a bit too dark. This emerald has poor clarity with many whispy inclusions and fractures typical of emerald. However, the main detractor of its value is the yellowish green color. An emerald's color should be a bit bluer and more vibrant. This is an example of a very poorly cut emerald. We can see through the bottom, which means it was not cut properly: light should be reflected back to our eyes. The facets are also uneven and chipped. Like most emeralds, this one is include_onced so the clarity is poor. The color in this one is too teal and too pale. actually i am wearing an emarald and a sapphire which costs me altogether 1.2 lacs approx but i am not satisfied with its quality ,after investing such a large amount though a sller has guaranteed me an replacement guarantee with some deductions......please help me getting the right stone because my career is at the stake.